Plate ‘n’ Sheet Professional Software unfolds sheet metal shapes commonly used in the ducting, piping and other steel fabrication industries. With Plate ‘n’ Sheet there is no need to construct a 3D model. Quick results can be obtained by users with very little CAD experience. Our unfolding sheet metal software easily unfold hundreds of shapes without using any drafting or 3D modeling programs. 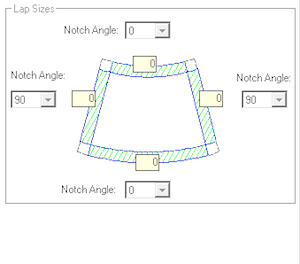 Flattened shapes can be produced quickly and easily by entering values such as diameter, height and angles into a user-friendly dialogue box. Our unfolding software allows gives you complete control over dimensions and other parameters that define the shape. These may be altered at any time and the appearance shape will change dynamically. Where possible, error messages will let you know if a parameter is not valid for the shape being created. 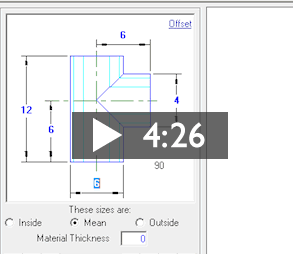 Several dimensioning modes are available and the result will be a pattern that can be printed or exported as a DXF for use in other CAD applications like AutoCAD®. Use “Pan” when you wish to center the image on the screen. Pan moves the field of view without changing the magnification. While the model or pattern appears to move on the screen, it is important to realize that the field of view is all that is changing and that the coordinates of any point on the model do not change. 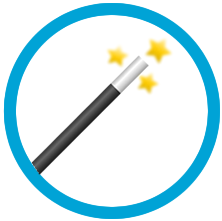 Use when you wish to magnify a part of the model or pattern to get a closer look at it. Pick the diagonal corners of a box or window around the area you wish to examine. Note: After picking the first corner with the left mouse button, hold the button down and release it when the window is the correct size. The area inside the window is enlarged to fill the screen. A message is displayed when the limits of magnification are at the maximum. Use when you want a closer look at the image on the screen. For example if the image is too small, use zoom in to enlarge the image on the screen. As with other display functions, it is important to realize that only the image is getting larger, measured distances and dimensions on the shape do not change. It is similar in principle to viewing an object through a magnifying glass. Use when you wish to make the image appear smaller on the screen. See also Zoom In. Use when you wish to zoom the image so that it is as large as possible while still fitting all of the image onto the screen. Start Plate ‘n’ SheetPlate ‘n’ Sheet and click the “New” button and select a category by clicking on one of the shape images. This will display a Model Window and a diagram of the shape with spaces for entering the dimensions. Use the left and right pointer buttons to scroll through the choices until you find the one that is the best match for the information. Enter the values that define the sheet metal shape. View the 3D model by clicking any of the view buttons. If the model is not visible or partly off the screen click the “Zoom Extents”. When you are satisfied with the appearance of the model click the “Develop Pattern” button to view the pattern. You may alternate between model view and pattern view as you wish. Add dimensions if required. There are several different methods available, displayed in the “Dimension” pull down menu. Print the image to your Windows System printer or export a DXF file for use in a CAD program or profile cutter. 1) Software is delivered electronically. 3) We recommend backing up your file after download to a cloud/ external drive. These tutorials can be downloaded from the menu below by right clicking on the link and selecting “Save As”. The tutorials are in PDF format and require Adobe Acrobat Reader. Try Plate ‘n’ Sheet today for FREE!